Latest Holiday Weather, developed by ADIMIA Limited, seems like a bit of an odd duck. After all, the weather app market is fairly crowded, with tons of competition from free apps. So why spend 99 cents on this one? 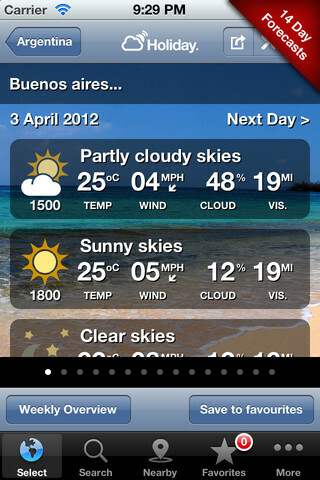 True, nearly any other weather app can give you the same information about hot holiday destinations. But that being said, Latest Holiday Weather is worth checking out because of its slick design, comprehensive database, and ease of navigation. Unlike many other weather apps we’ve tried, the temps and other data load almost immediately. Factor in the beautiful design, 14-day forecasts with either 3- or 6-hour breakdowns, and it’s pretty much perfect for planning a vacation or weekend getaway. The developers claim they will add any destination by request, but chances are you’ll find what you’re looking for. 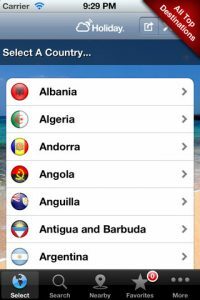 At present, there are over 1,000 destinations from around the world currently listed within the app’s library. And since this is serving an international clientele, it’s really easy to switch between temps in degrees C or degrees F. Plus, each forecast includes wind speed and direction, cloud cover percentage, and visibility. In other words, everything you could possibly need to know before planning a beach trip. 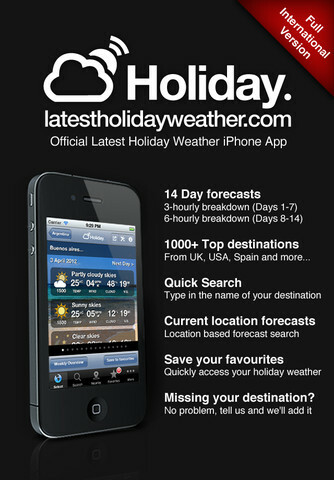 But lest you think this iPhone app is only for party hotspots around the globe, Latest Holiday Weather offers a one-click local weather solution, using your iPhone GPS location to provide you with the weather forecast for your current location. If you travel a lot (even if its only for business), this jet set-ready iPhone app is the perfect cheap addition to your stable or apps. It may seem redundant with other weather apps already in your phone, but despite your first impressions, Latest Holiday Weather is worth a closer look. 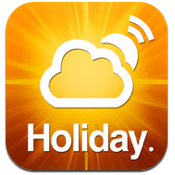 Latest Holiday Weather is compatible with iPhone, iPod touch, and iPad. Requires iOS 4.0 or later.